5, 6 and 7 Marine Parade, for many years known as the Albermarle Hotel. It was founded at No.7 during the 1850s and is listed at such in Folthorpe’s Brighton Directory of 1859. For many years the other two premises were lodging houses, but they were absorbed into the Abermarle in the 1890s. 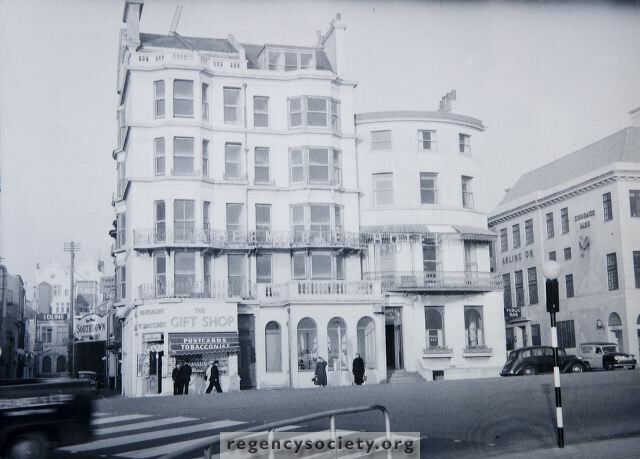 When the property was sold for redevelopment, Brighton Corporation consulted the Regency Society as No.7 had been listed by the Ministry of Housing and Local Government as a building of Special Architectural Interest. It was not felt that the quality of the building was good enough to justify opposition to its demolition, so down it is to come. The photograph was taken in January 1958, when the premises were awaiting demolition.